Kohima, Sep 26 : The northeast region has produced several artists who excel in the field of music. Now, a very popular folk music band from Nagaland, the Tetseo Sisters, has taken the Naga folk music to the national and international level. 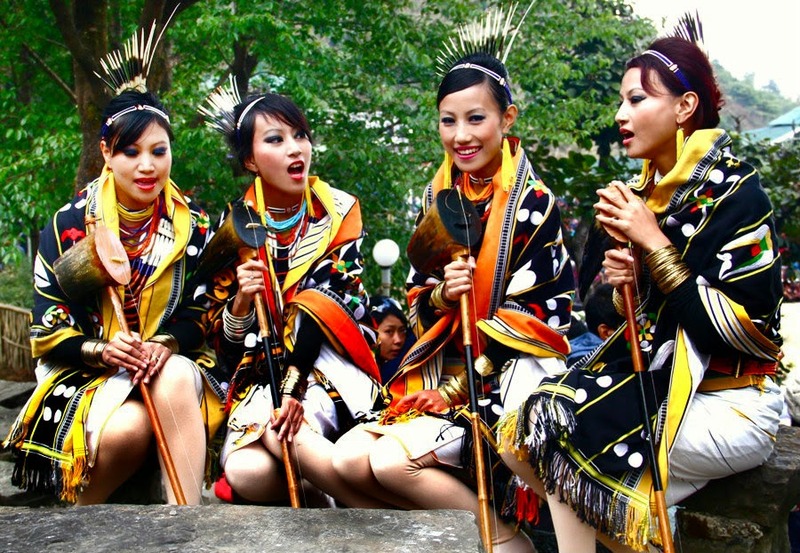 One of the most popular female bands from Nagaland, they sing songs known as "Li" (folksong) in the Chokri dialect of the Chakhesang tribe of Nagaland that tells stories of Naga people, their joys and sorrows, hopes and aspirations. They started practicing music in their school days and have not looked back since then. They specialize in folk music and aim to keep it alive among the youth. "We keep travelling place to place. Eventually we have been invited for cultural exchange program and have performed at many othrs an event that's how we began our journey. As we perform more and more our identity become stronger as a folk singing group. A lot of people called us folk singing sisters on TV. Well then, we became Tetseo sisters," said Mercy, member of the Tetseo sisters. The Tetseo Sisters comprise four siblings - Mercy, Azi, Kuvelu and Lulu. The sisters released their first album of acoustic songs called "Li" Chapter One "The Beginning" in 2011. During their performance they use age-old Naga string instrument known as "Tati or Heka Libuh". They have performed in different places across the country and abroad. Recently, they mesmerized the audience at Scotland, Myanmar and Thailand. "We have been performing for more than twenty years so we finally record an album called "Li" the chapter one along with my sisters and it consists of 12 songs. Theme of the song is about love, peace and different festival," said Kuvelu, singer of Tetseo sisters. "We realize that our folk music is important, different and unique and it's really beautiful so our parents also encourage us a lot they taught us song, they taught us how to play Tati," added Mercy. The Tetseo sisters are playing an important role in preserving folk tradition of Nagas and are currently working on their upcoming album. Any quite examine program distribute all around year around, permits you to drastically eliminate settlement per month. you need to makes least monthly premiums, or maybe you may be able to disbursed any quite entire among the littlest quantity examine once you in addition as. Any time somebody disbursed fenced in, somebody restriction the length of this sort of mortgage and collectively avoid beside fascination payday loans value. the particular subject disposal decisions conjointly are going to be uncomplicated fascination disposal decisions. out there for you, therefore you may be able to settle your mortgage among the beginning and collectively facilitate save fascination around the mortgage. There are no precise requirements almost about the shape because of the reality; not everybody is relaxed with the identical configuration. So telephone producers each strive a selected technique in their very own.